Baked oatmeal is such a favorite breakfast in our house, and I have fun inventing new recipes with each season. With its bounty of fresh fruit, summer affords numerous opportunities for reinventing this wholesome, delicious start to the day. The make-ahead factor is key. You may certainly prep this dish the night before and bake in the morning. Crazy as the mornings can be, however, I often mix the ingredients early in the day and bake at night so that all I have to do is slice and eat in the morning. Warm slightly, if you please! Note: Over the many times I’ve baked this oatmeal since first sharing the recipe, I’ve often made it without the mascarpone cheese and have reduced the soak time to an hour or two. Technically, you could bake right after mixing all of the ingredients — I just like to give the oats time to absorb the liquid and accompanying flavor. If you do bake right away, you may need to add a few extra minutes to the cook time. If you are a fan of nuts, this oatmeal pairs quite well with almonds. You may stir a quarter to a half cup of toasted, slivered almonds into the batter if you like the added flavor and crunch. Or, simply sprinkle some nuts over the top prior to baking. Pecans and walnuts compliment this dish well, too. The mascarpone adds an extra layer of flavor, but this dish is delicious without, too. Grease a 12-inch cast iron skillet or 9×13 baking dish. In a large mixing bowl, combine all ingredients except the oats, mascarpone, and brown sugar. Stir in the oats and combine well. Transfer the mixture to the prepared skillet and spread evenly around. Dot the mascarpone cheese evenly across the top, and then cover tightly with plastic wrap or foil and refrigerate overnight. In the morning, preheat the oven to 375 degrees. Allow the oatmeal to sit on the counter while the oven is preheating. Uncover the oatmeal and bake for about 35 minutes or until just firm in the middle. Remove from the oven, switch oven setting to broil, and sprinkle brown sugar over the top. Broil oatmeal for one minute, watching closely, or until the sugar is melted and top is golden. I have made this recipe oodles of different ways, including with the grated apple or the applesauce, both, and neither. Including the applesauce along with the juicy peaches provides more moisture and a hint of a custard flavor, thanks to the four eggs. Omitting the apple and/or applesauce yields a slightly less moist finished product, yet not at all dry. In my mind, both versions are equally delicious yet slightly unique. While I typically take my own photos with my trusty iPhone, this gorgeous picture was taken by the very talented Jeremy Hess. Click HERE to visit his Facebook page and see more of his amazing work. So awesome!! I love this idea. I have never baked oatmeal. This is on my must try list!! Thanks for sharing it on Manic Monday! Although I really don’t like oatmeal. This looks good and maybe I would like it if I tried it. I have some fresh peaches so maybe will give it a try on my next morning off. Thanks for sharing on Foodie Friends Friday. Congratulations on your bi-weekly column! This recipe is wonderful and I cannot wait to make it! Thank you for sharing on Thursday’s Treasures Week 46. I’ve featured this on week 47. <3 and hugs dear! Thank you for featuring this recipe, Debi! I just provided a link so no one will miss all the other delicious recipes you have showcased there! This is amazing!! Love this yummy breakfast, Ann! I never thought that my children would eat this, they are so picky but I made it one evening and it was gone by noon the next day–everyone loved it. Great recipe, thanks for sharing. I am thrilled it was a hit, Lesley! Thank you for letting me know! This is a wonderful recipe but it is not gluten free: oats have gluten in them! Thanks for your comment. There are oats that are certified as gluten-free–grown and packaged where there is no cross-contamination. Some people with celiac disease or a gluten intolerance also have an intolerance to oats. In that case, this recipe may not be the best for them. Perhaps that is the case for you as well. Bob’s Red Mill is one brand that sells gluten-free oats, and there are others. I hope that helps! This reminds me of a dish my mother made when I was a little girl. She would use different fruit. Sometimes peach, sometimes plum and other times apple. Thanks for the comment, Susan! My grandmother made lots of stovetop oatmeal, cream of wheat, etc., but she never baked it. Plum is one fruit I haven’t tried yet and I bet it would be delicious! I have made this recipe 2 times now, since i saw it in the Sunday News. LOVE it! I also made the Corn and Basil Salad that was featured in the article. That was quite yummy, as well. Thank you for such wonderful recipes! You are welcome and thank you very much for letting me know! I am thrilled you have made–and enjoyed!–the recipes and I hope I come up with more that you will want to cook! I have made this recipe numerous times since I saw it in the Sunday paper. The last time I made it I used my sliced frozen peaches. The end result was the same. I cut the peaches into pieces while they were still frozen and immediately added right before baking. I think I should have froze more peach slices this summer- the original purpose was for smoothies and a favorite quick grab snack for the kids. Now with this new family favorite recipe I am sure to run out before next summer. Hopefully I can convince the kids that apples would be a nice substitute! I love the make-ahead characteristic of this recipe (Christmas Morning, here we come) but does this dish NEED to sit a spell before baking, or can it also be baked off right away? I prefer to let it sit before baking. That said, you really can bake it right away, adding a few minutes to the cook time as needed. If making muffins as I mention in some of my baked oatmeal recipes, allowing the batter to sit in the mixing bowl for at least four hours will allow it to firm up and transfer easily to the muffin tins. I hope that helps, and I hope you enjoy! I made this last week and LOVED it! I make the apple version a lot but with the extra peaches we had in the house, I decided to try this. I hope to make it again soon before peach season is over. Thanks for another fantastic recipe! Yay! I am so glad, Amie, and appreciate the feedback! Because we miss this recipe and the strawberries and cream version when peaches and berries aren’t in season, I have started using frozen fruit on occasion. It works surprisingly well. I even found a brand of organic strawberries that are almost as good as using fresh. By the way, if you use frozen fruit, you can chop when still frozen–maybe allow to sit out for a few minutes to soften a little–and add to the batter while still frozen. My family has been craving your peach blueberry pound cake but this is a perfect recipe for breakfast…so glad I made it!!! I’m glad you tried it, too, and am happy the pound cake is a family favorite! 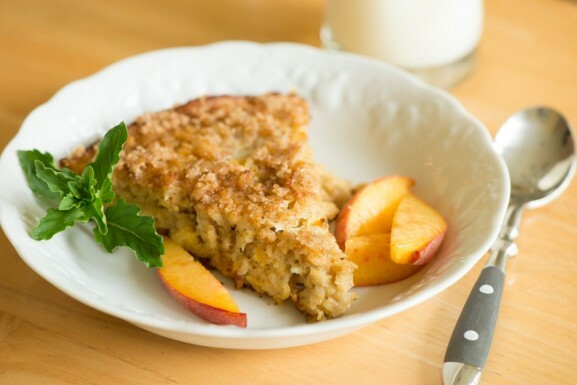 I love all your baked oatmeals, and peach is my favorite…thanks for a great recipe! There’s something so delicious about a juicy, ripe peach…glad you love them in this recipe! YOU DID IT AGAIN. 🙂 MORE WONDERFUL RECIPES. THIS IS A KEEPER KEEPER! Not surprised, but this was fantastic. I made this during a weekend full of family in town. Super easy and delicious. My boys love baked oatmeal and they had two bowls each! I used half frozen peaches from our family peach tree and half fresh. I also included raisins because my boys love raisins (and so do i). I had to grate an apple, all out of applesauce! Next time I have to try marscapone cheese, I used cream cheese. I have never used marscapone! How wonderful that you have a peach tree! Your tweaks sound perfect. The beauty of this recipe is how flexible it is. I made a super speedy version last week and didn’t use either apple or cheese option and it still tasted great. Thanks for your wonderful feedback, Christie! I needed to make breakfast for a weekend retreat, so I mixed up the oatmeal ahead of time (doubled recipes) and froze it in gallon sized ziplock bags. Once I got to the retreat, I just had to thaw it, and pour it into my foil pans for baking. I dotted the swirl ones with the cream cheese and baked, adding the brown sugar at the end. I didn’t have a broiler available, but it was delicious anyway. I made 4 flavors, apple-cinnamon, blueberry-swirl, peach-swirl & blackberry-fig swirl. All were a huge hit, and I had lots of requests for the recipes. I think the blueberry was the official favorite, but they liked them all. Most folks got a little of each as they went through the line rather than picking just one. Most of them had never heard of baked oatmeal before, but they’re definitely sold on it now. They’ve already requested that I make it again for next year’s retreat! 🙂 Thanks again!! Thank you for the wonderful feedback, Faith. I’m delighted that the baked oatmeals were a hit and that the freezing was a success. It sounds like you worked hard and I am so happy your efforts were so appreciated. That always makes the work feel good! I’ve made this twice in the last few weeks! It’s amazing! Great news, Joye. So happy it’s a hit! Made this and it was AWESOME! Added a bit of pure almond flavoring and used quick oats but otherwise followed the recipe exactly. Came out more like cake which was really awesome!! YAY! Replacing my old recipe with this one. Thanks! I’m so glad it’s a keeper, Deb, and that you liked it with quick oats. A little almond extract sounds lovely!